Just northeast of the Chesapeake Bay Bridge. 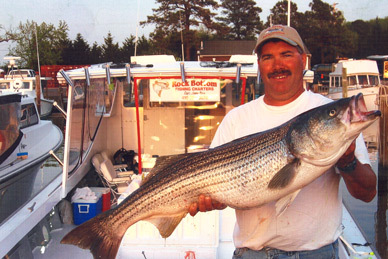 You will be traveling the Bay on one of the largest fishing boats in the upper Chesapeake Bay Area. The Rock Bottom is a 46 foot customized charter boat purchased in 2004 for Rock Bottom Charters. Large cabin with dinette and head. Plenty of room to spread out, relax and enjoy the view. Six men can comfortably fish from the stern.